Looking to see who to donate to? Player Compendium is this way! Ready to join or donate to the compendium? Reach out! Got questions? We have an FAQ! The compendium will run till February 1st, so act soon! We are organizing a community effort to help fly others out. If you’re a player who wishes to make it to NCR but lack funds, this compendium is your chance! Donors who wish to help out players contribute funds with a player list. This list is the preference of players the donor wants flown out. The first person on the list would be the donor’s first choice, and all funds will go to that listed player. At the end of the compendium event, if the player does not get enough funds to fly to the event, then the donor’s funds instead go to the second player on their list. If the second player does not have enough funds either, the process repeats down the donor’s list. Suppose a kind soul contributes $20 to fly out their close friend, but also is a fan of a few other players in their local scene. They would contribute $20 with the list “Friend, Local Player A, Local Player B.” Thus the compendium would initially reflect a $20 donation to Friend. Donation goes to the first person in the donor’s list, i.e. the donor’s first choice. However, if Friend does not receive enough money to attend NCR, then the $20 will be moved from Friend to Local Player A. If that person also does not have the necessary funds, the $20 moves to Local Player B and so on. Friend did not meet compendium goal, so money is moved to the next person in the donor’s list. The goal of this system is to align the rewarded players along with the donors’ preference as much as possible, even if some donors’ first choices are not fully satisfied. Pokken @ NCR 2019 will start with a $500 pot bonus. However, donors feeling extra generous can also donate to the pot bonus. As a symbol of thanks, we will make sure to mention them throughout the duration of the compendium (if they so choose) and also match 50% of the donation to their player(s) of choice. We will match up to the first $1000 donated to the pot bonus ($500s matched to players of the donors’ choice). For example: The donor from earlier can choose either to contribute $20 to Friend, or $20 to the pot bonus. The pot bonus receives the $20, and we match $10 to Friend. If Friend does not meet their goal at the end of the compendium, then it will be the $10 that will be moved. Donating to the pot bonus means more money for the event, and donors still get to support players they like! As mentioned earlier, players who do not receive enough funds will be crossed off the lists of donors’ to reallocate funds to other players. But there are many such players and many such donors involved. In order to correctly process funds, we remove players from the compendium one-by-one, rather than simultaneously removing multiple players. First, players are checked to see if it is possible that their goal can be met. This is done by adding up the contributions of every donor that has the Player in their list. If this sum does not reach the Player’s goal, then it's not possible for them to be flown out and the Player is removed from the compendium. When all the remaining players can be potentially flown out, their Support Amounts are calculated. A Player's Support Amount is simply the sum of funds from donors who either have the Player at the current top of the list or second from the top of the list. 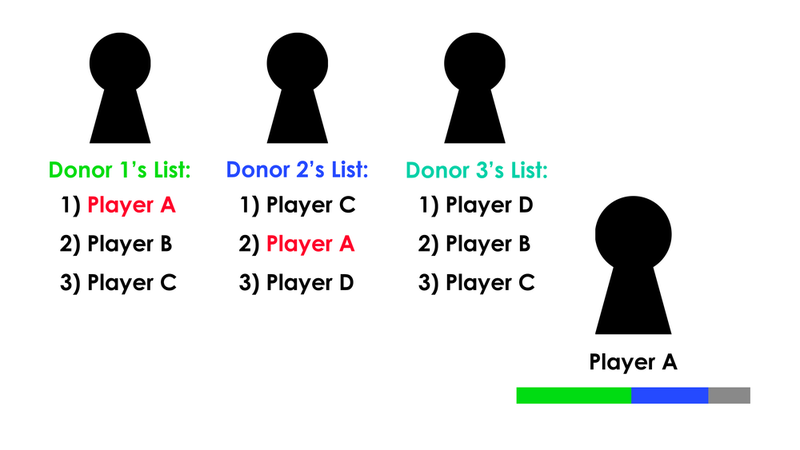 Player A is listed in the top of Donor 1’s list and is also the second top of Donor 2’s list. Thus their Support Amount is the sum of Donor 1 and Donor 2’s contributions. Donor 3 does not list Player A at all, and their contribution does not get added to Player A’s Support Amount. Then, a Player's Support is defined as their Support Amount divided by their compendium goal. This will be a percentage from 0 to 100%. Player A is eliminated for having the lowest Support. This can happen even if Player A currently has more funds than Player B.